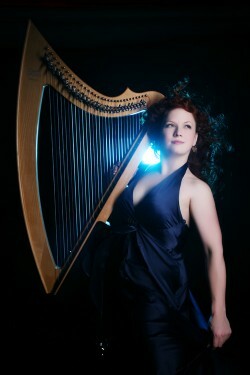 Rachael Gladwin is a contemporary harpist based in Manchester, UK. On harp Rachael specialises in touring and playing with bands, music for theatre and street theatre, large scale performance projects, session and studio work and improvisation. 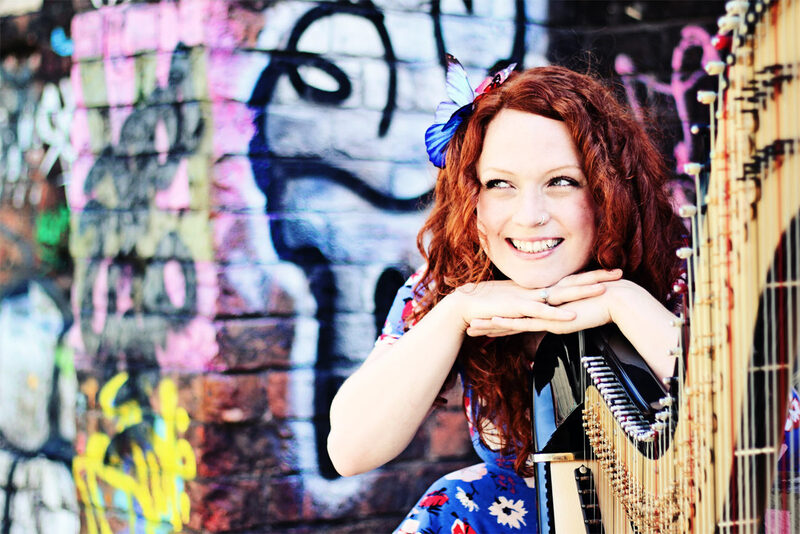 Also a vocalist, songwriter, composer and player of other instruments, Rachael began on harp at the age of five and later trained at the Liverpool Institute for Performing Arts graduating in 2008 with a first class honours degree in Music. Rachael’s work is extensive and diverse; her latest additions to her session discography include albums from Guy Garvey, Corinne Bailey Rae, DJ Shadow and Dutch Uncles. 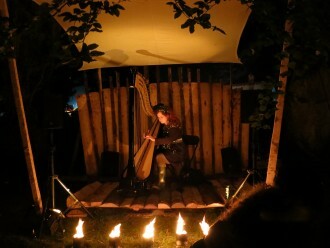 Her recent theatre and outdoor work includes composing and performing an original score for Odd Doll Theatre of Puppetry‘s 2015 show Red Rust, and creating improvised harp concertos for spectacular fire shows with pyrotechnics company pa-BOOM. With the Matthew Halsall Sextet Rachael plays regularly on the UK jazz circuit and has recorded live sessions for BBC Radios 1, 2 and 3, and Radio 6 Music. With her own band, Rachael and the Red Socks, she released her debut album ‘Melodies and Time’ in 2011 and her second album will be released in autumn 2018. Internationally, Rachael has been the harpist for the dazzling French street theatre company La Machine since 2008, where she performs on a moving cherry picker 40 feet in the air in front of outdoor audiences of over a hundred thousand, including shows in Japan, China and Europe. On other live and recorded projects Rachael has worked with Nitin Sawhney, Gilles Peterson, Jimmy Osmond, Susan Boyle, Pee Wee Ellis, The Haggis Horns, Horse and Bamboo Theatre, Arun Ghosh, Patrick Forge, Vanessa Freeman, Fingathing, Liverpool Culture Company, Proper Job Theatre Company and many more fantastic artists and organisations. Rachael is endorsed by French harp makers Camac and plays their 44-string electro acoustic pedal harp, the Little Big Blue, and their 30-string electric lever harp, The Baby Blue.